Skagway has something for everyone and one day isn’t nearly enough time to get the true sense of our historic little town. Whether you are driving, flying or arriving on the ferry, staying only one night will likely leave you feeling rushed and wishing you had more time. 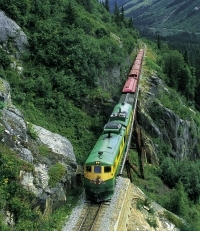 Constructed at the turn of the century, this narrow gauge railroad is nothing short of spectacular as it climbs the mighty White Pass into Canada. Excursions can take anywhere from 3 to 8 1/2 hours, depending on your interests and schedule. LEARN MORE . . . The Days of ’98 Show is an hour long historical musical comedy. Prior to the evening shows you may ever partake in mock gambling and listen to Robert Service poetry. LEARN MORE . . . The Klondike Gold Rush National Park offers a visitor center with static displays, movies, as well as a guided tour of several different sites and restored buildings through the historic district. 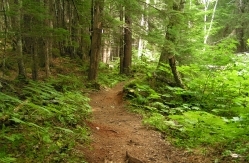 An 8 mile drive takes you to the historic and ever popular Chilkoot Trail in Dyea. Open daily, featuring many treasures from our gold rush history, native influence, and local artists. LEARN MORE . . . There are great day hikes, fantastic shopping, fishing, intriguing art galleries, scrumptious locally owned restaurants, funky coffee houses, and a variety of walking or bus tours. If you take a little extra time to revel in Skagway’s history, you can catch up on your correspondence, whether it be postcards or e-mail, enjoy the sweets of the Kone Kompany’s fudge or an ice cream cone, dine on the waterfront and have a beverage at an authentic Alaskan bar. Want more adventure? Take a helicopter onto a glacier and go dog sledding, or kayaking. There is also horseback riding, glacier bay flight seeing and bike tours. Skagway provides for a great place to have your base station for side trips to Haines, Juneau, Whitehorse and Glacier Bay. If there is one piece of advice we can make after serving visitors for over ten years, it’s to spend a little more time along the way. Alaska is about a slower pace of life. After all, Skagway is the Garden City of Alaska, so take time to stop and smell the roses.